I’ve made some nice finds in the past couple weeks, the majority of which came from two different million dollar homes. 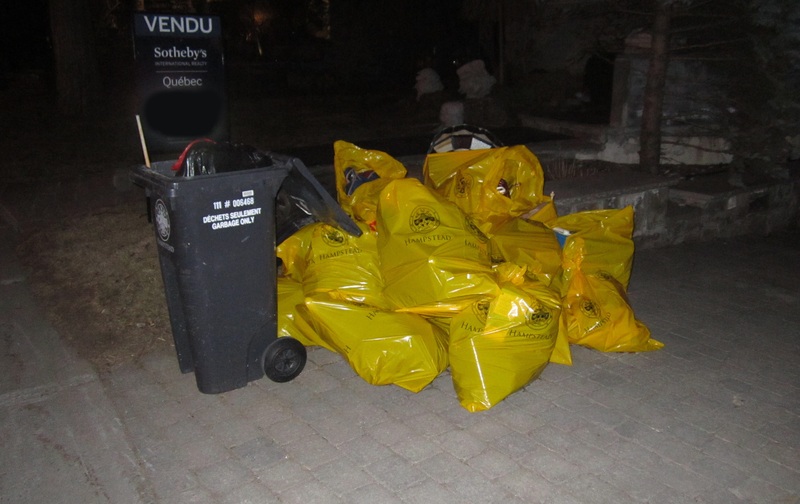 The wealthy neighbourhoods they reside in have local security and by-laws against trash picking, meaning I had to be careful not to get caught lest I be fined again. This first pile was troublesome for that reason. 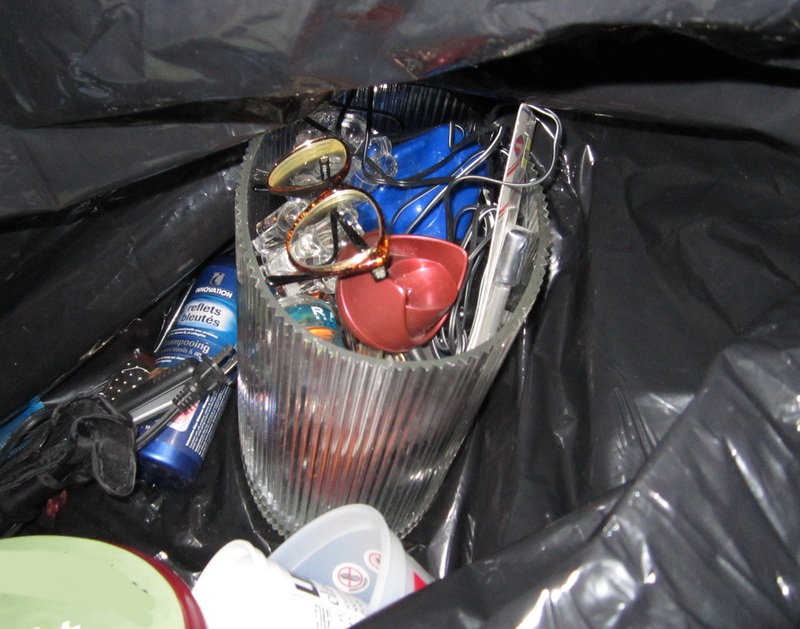 I stopped and quickly identified that the contents of the bags were worth investigating. However, I saw the security SUV coming around the bend soon after I started sorting. I got inside the car, which appears to be a sort of safe zone that repels security folk, unless of course you were obviously picking beforehand. The officer stopped next to the car and leered inside, effectively creeping out my friend Sarah who was a passenger at the time. However, he otherwise made no effort to confront us. We left the scene, but I was determined to come back later after the heat had died down. We ended up killing some time checking out Cote St-Luc’s recycling day, where I found a cool high school yearbook from 1969 that I wouldn’t have saved otherwise. I returned maybe 30 minutes later, but again saw the security vehicle not long after I arrived. I was near the car and empty-handed at the time, once more in that safe zone that seems to exist. (I also make a point to play with my cell phone at these times, which I theorize makes me look more like I “belong”). He didn’t stop that time, but suspected that he might have had a plan to catch me in the act so I decided to leave the scene once again. At this point it was getting pretty late and I had to drive my friend home. I was also quite tired. However, I had the feeling there might be some good stuff left in those bags, and in the past I’ve regretted not being more tenacious in the face of this kind of adversity. I decided to go back and this time no security officers were around to get in my way. I worked quickly, putting bags in the car and then sorting through them elsewhere. The last two bags I just threw in the car to sort through the next day. I’m glad I went back, because one of my best finds was in one of those bags! 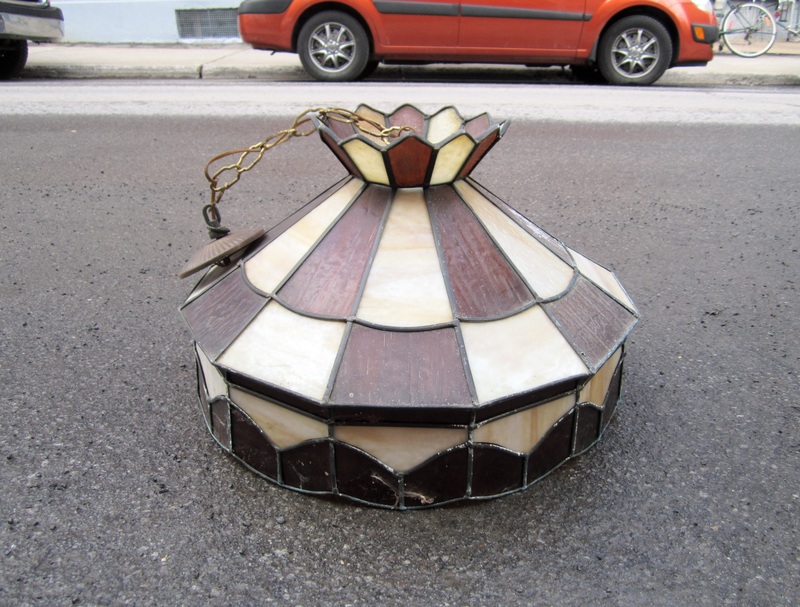 The first thing I put in the car was this large vintage hanging lamp (you can see it in the back of the first picture). None of the glass is broken, but it could use a good cleaning and a bit of TLC. 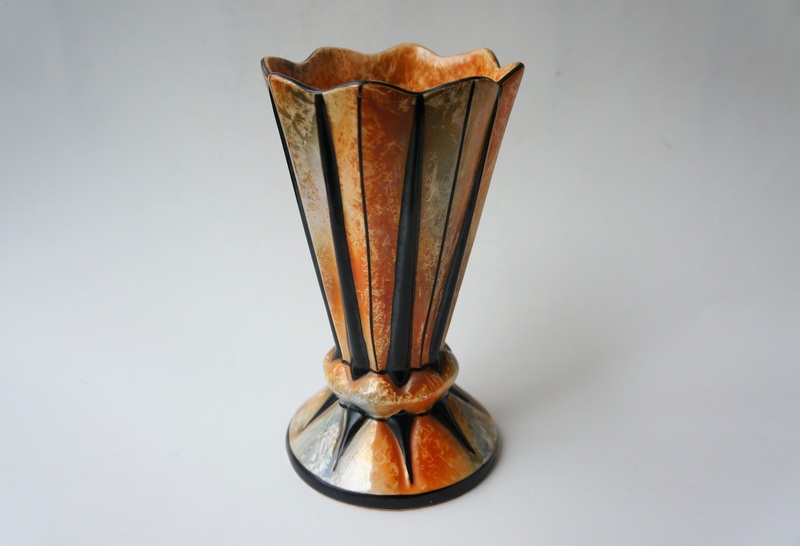 This vase looks fancy. The glaze has a marbled look to it, which I think is a bit unusual. The bottom is stamped “Made in Czechoslovakia.” If you know anything about this vase, let me know in the comments! 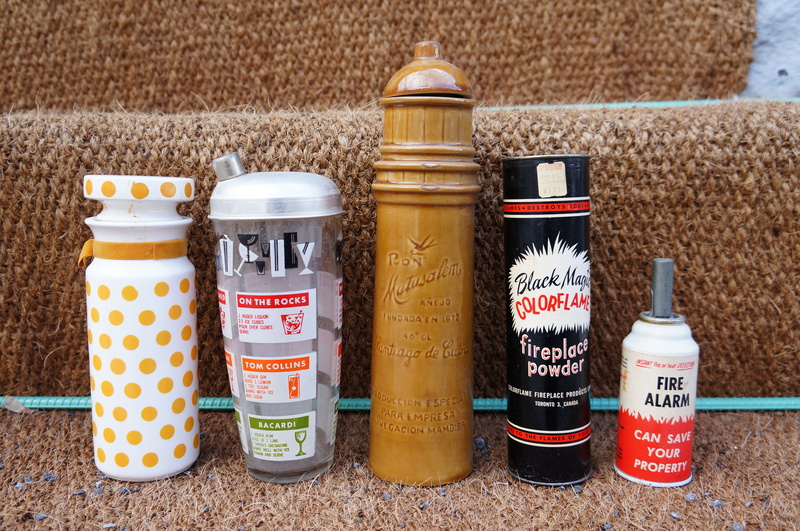 I found a few cool vintage bottles and canisters. 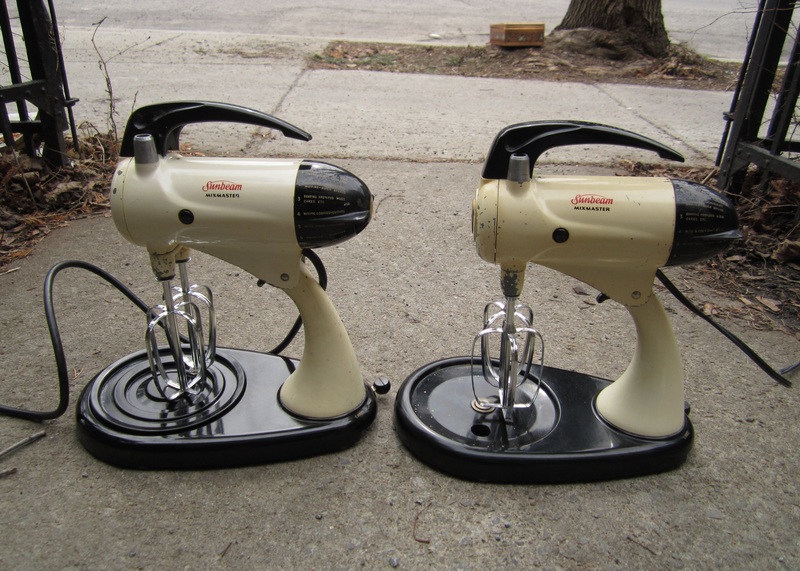 I’ve never seen a “fire alarm” like the one on the right before – were these common once upon a time? The drink mixer is pretty neat, but I can’t get the lid off. 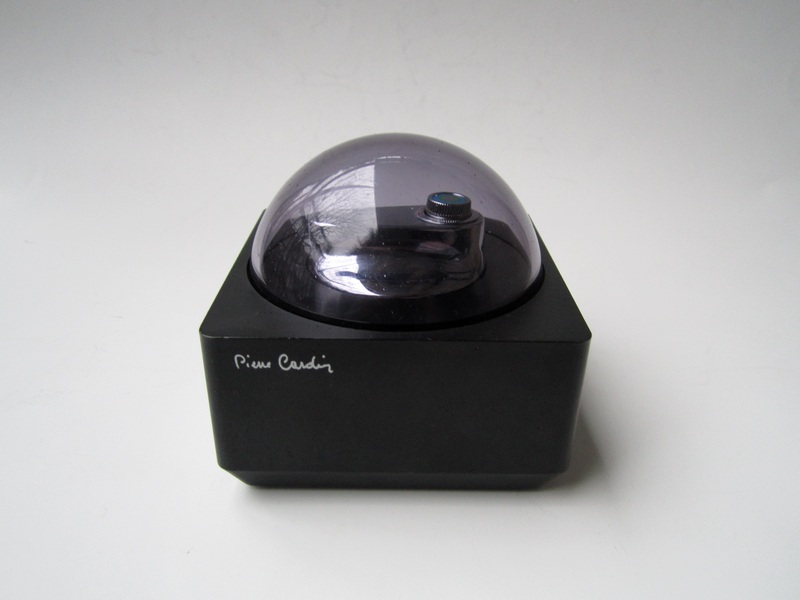 This funky electronic lighter was made by Pierre Cardin. 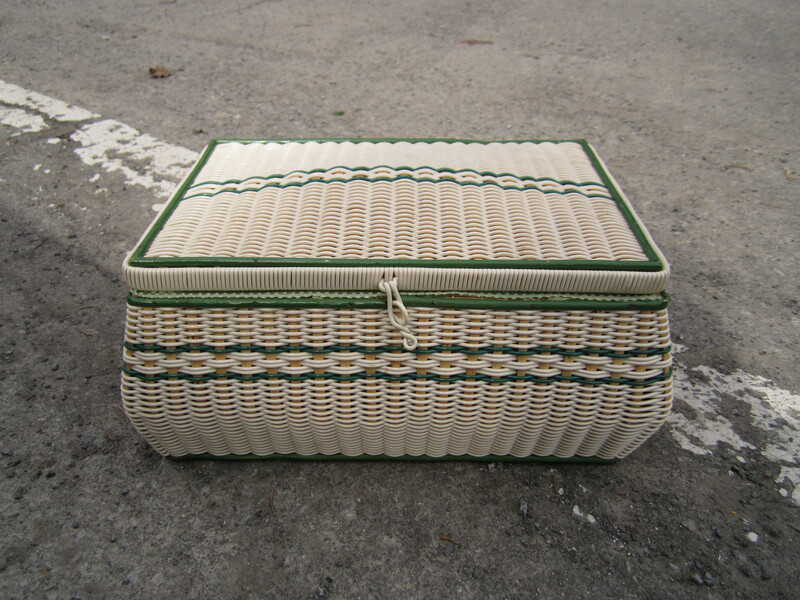 One like it recently sold on eBay for about 100$. 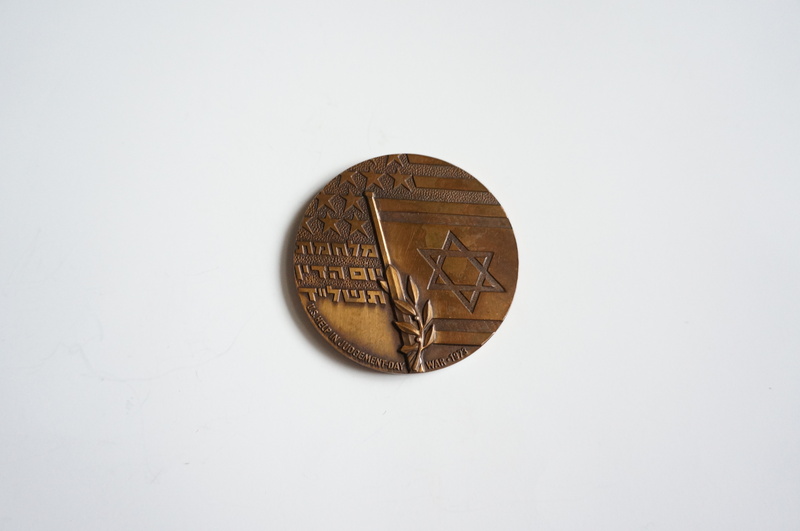 It seems that many Jewish households possess items commemorating Israel’s various military victories. 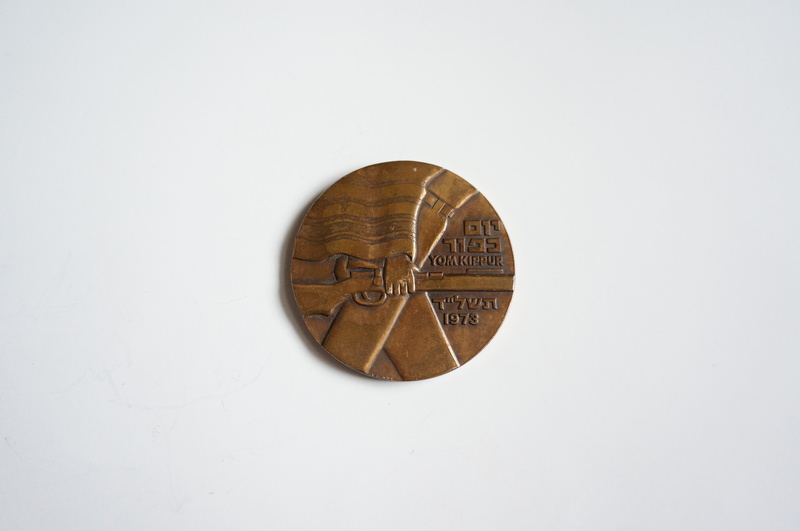 This medal is a particularly nice example of such a piece. It expresses gratitude to the United States for their help in the Yom Kippur war. It’s quite large (58mm in diameter) and well designed. My best find though was likely this watch, which I wouldn’t have found if I hadn’t returned that third time. The strap is 70s or 80s junk, but the watch itself is very nice. It’s made by Longines, a renown luxury watch maker. 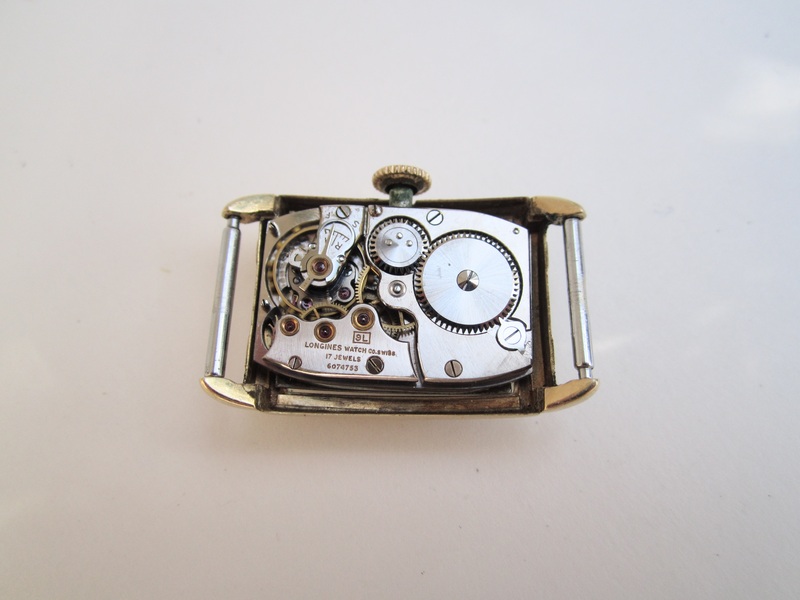 It’s not in perfect cosmetic condition, but the movement works nicely and the case is 14k gold. 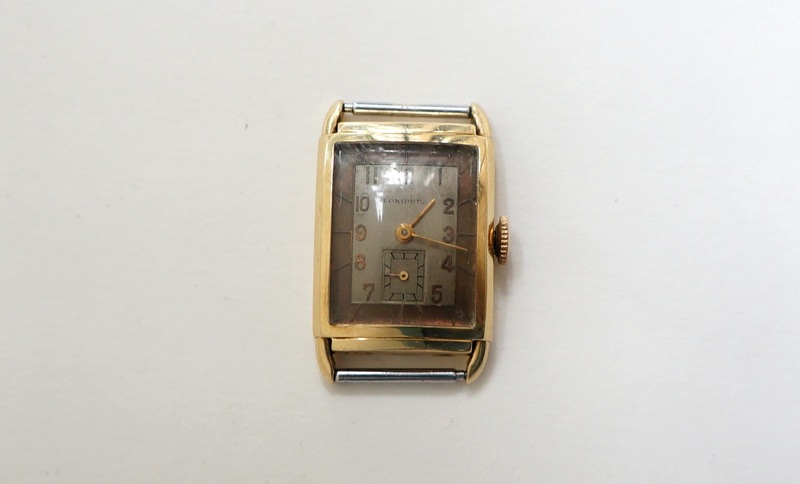 According to the serial number the movement was assembled in 1940. 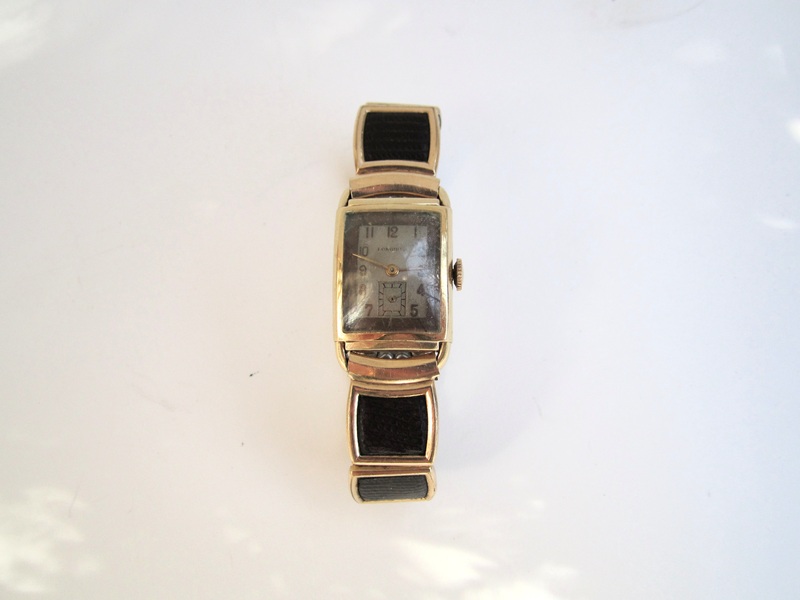 This is the second gold watch I’ve found this year, the first being the Omega I happened upon back in January. I expect this one will sell for between 300-400$, making it well worth staying up past my bedtime for! I came across this pile last week, around the time the clock turned and it became my birthday! Thankfully I didn’t have to worry about security this time around. There was a bunch of good stuff inside the bags, but this pile was most notable for the large quantity of eyeglasses it produced. Here, a pair of Christian Dior frames sits perched atop a loaded wastebasket. I saved probably two dozen pairs in all. Most are nice, if not particularly valuable. I’m going to put them out at a yard sale and see if they sell. 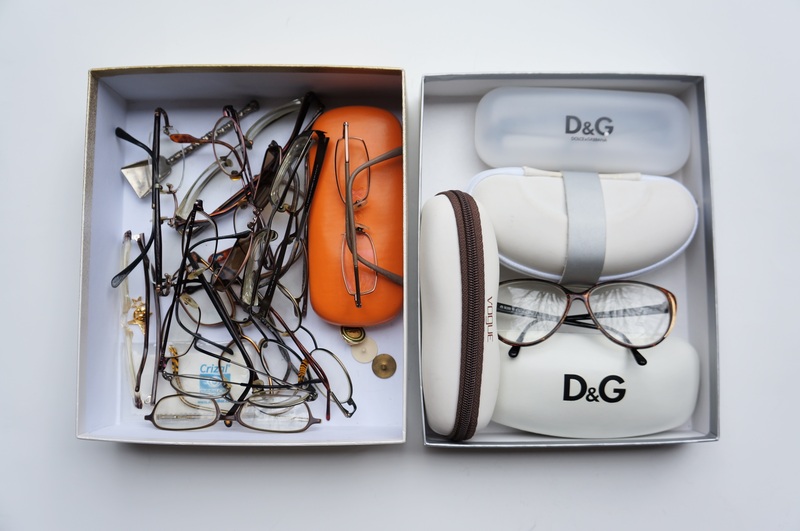 Several are eBay worthy, including those Christian Dior frames and four designed by Dolce & Gabbana. 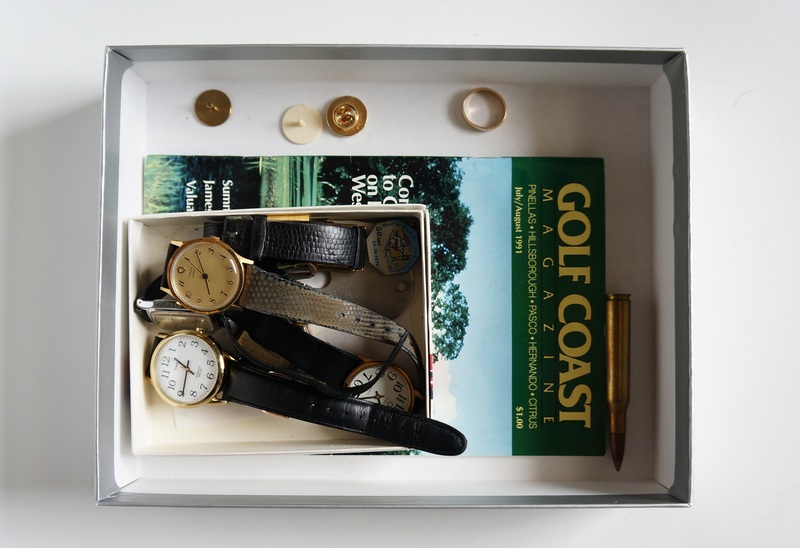 … and a junk box, which contained several watches, a 10k gold ring, and for whatever reason, a bullet. The watches aren’t too exciting, but they should do well enough at a yard sale. Three are by Timex, and one even has a working battery. The box itself was made by Armani. 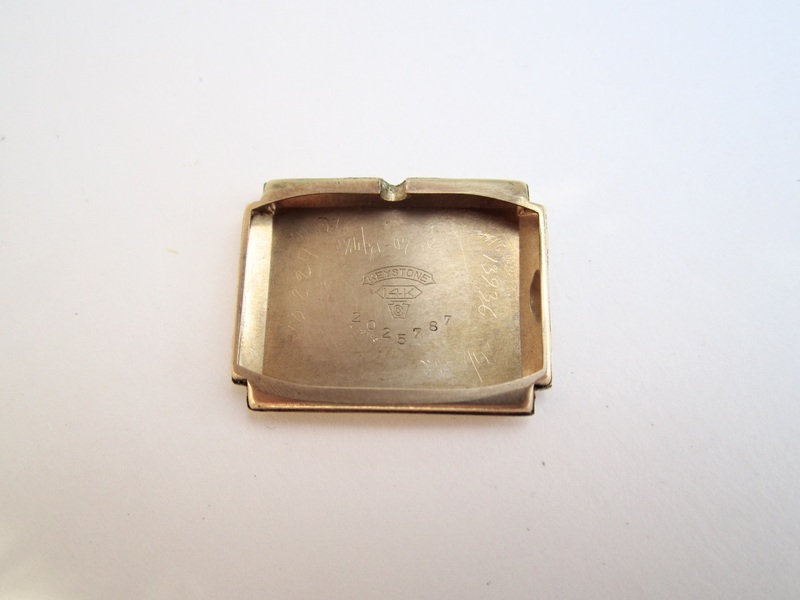 This plain and well worn 10k gold band might have been my favourite find here. It’s the epitome of junk gold; no one would pay me more than scrap value for it. In a way this is freeing, as I don’t have to worry about listing this stuff on eBay or Etsy. Scrap gold is about as good as cash – I can just bring it to the jeweler and get paid without much effort. 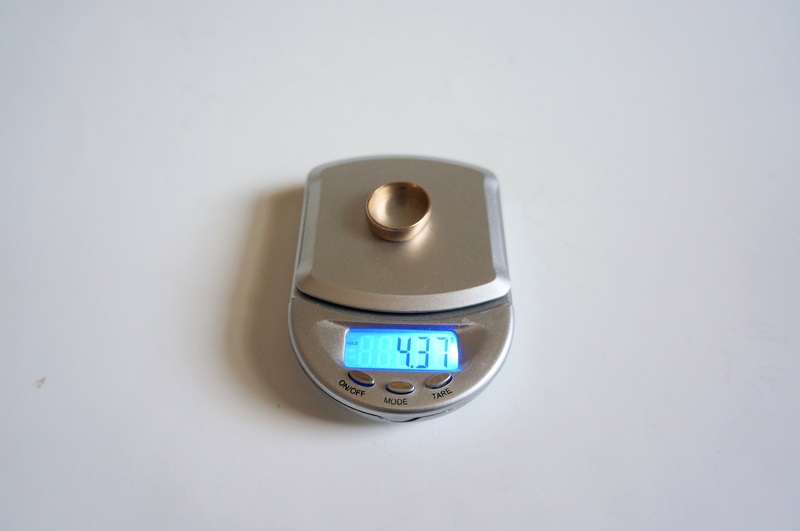 This ring weighs 4.37g, which makes its value in scrap about 92$. I get about 85% of that value when I trade it in, so finding this ring makes me about 78$ richer. Not bad! After a long drought of scrap worthy gold, I finally have enough to justify going on a scrap run. Happy Belated Birthday! Best wishes for success in the year ahead–starting with the great finds above! A gold wedding ring on your Birthday, you ARE committed to your job.A pity about the cat and mouse game. Nice haul for the tenacious one! Use WD-40, or any penetrating oil. 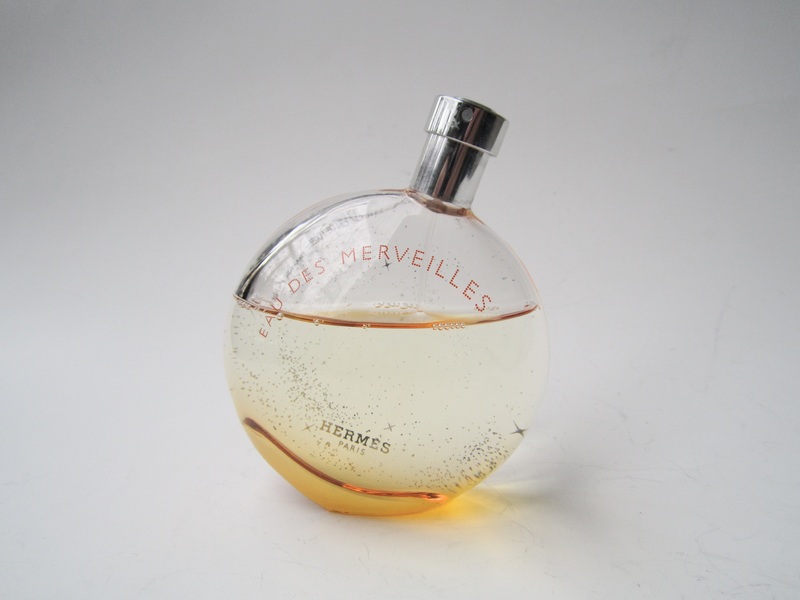 Spray a large amount around the lid, let it sit for a minute or two and then slowly twist the lid. It should come off. Based on the fact that if the pot were hot and the lid cold they would expand/shrink enough to dislodge the lid. Put the entire item in the freezer and leave overnight. 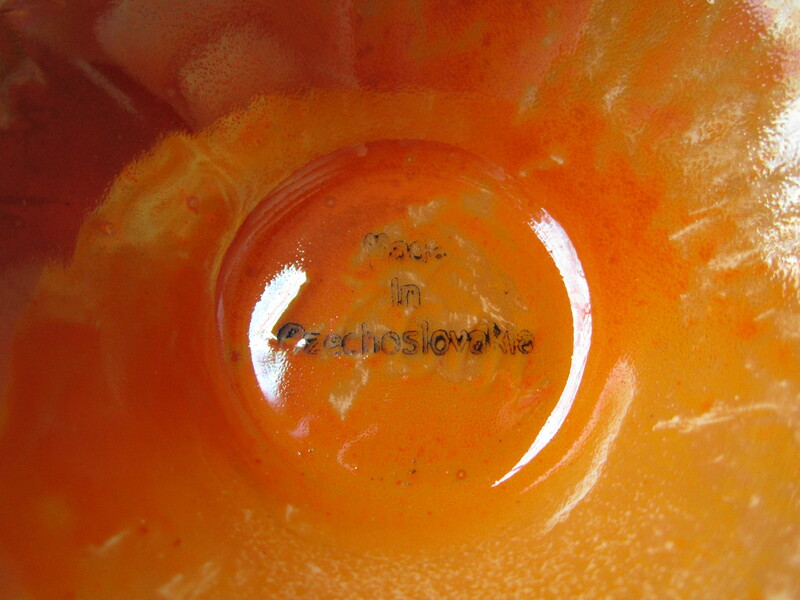 Remove the item and CAREFULLY re-heat it, BUT NOT THE LID, by running hot water over the body. After a few minutes, the lid should come loose. Thanks, it does seem to be a Ditmar Urban “Alien ware” piece. They look to be collectible, and I think mine is nicer looking than a lot of the other ones I see online (my subjective opinion, of course). a good thing, according to Albert Einstein. He said that most folks thought he was very smart, but that in fact, he was just more tenacious than anyone he knew. He said if something caught his interest/curiosity, he would “stick to it”, until the answer satisfied him.. I particularly like the vase. Cindy has a great idea! I stopped at a garage sale last fall while walking my sister’s dog, a full size Labrador. I could barely get a glance at things, he started poking at things on display on the ground. On the other hand, he likes garbage, but only if it’s food. He won’t untie the bags, he just tries to rip a hole in the side. If I stop to check something, he’s impatient, while I’m supposed to wait while he savours all the smells. Someone put out a few boxes of computer books for recycling a few months ago, he wouldn’t wait. Though onetime he found a bag of McDonald french fries in a bush, I think that’s his best find. Haha. I’ve thought about dogs in the past, and how they could be maybe trained to detect good garbage somehow. I suspect the easiest way to do so is just to get the dog to sniff the bag, and if they want to rip it open it’s probably food or other stuff I’m not interested in. If the dog isn’t interested, then it’s more likely I would be. It is a good idea. At the moment I don’t think I have the energy or time to train a dog correctly though. There’s nothing more annoying than a poorly trained dog, and I don’t want one example to be my fault. One day I’d like to have one, but only when I have the time and hopefully a nice yard. The seats are already down. I could pack a fair amount into that car. Still, I prefer to sort on the spot, because the car will fill up fast if my first instinct is always to throw bags inside, and I won’t have room for anything else. I don’t mind doing this on a small scale but try not to make a habit out of it. I don’t have much room in the car (a small hatchback), so if I throw in a bunch of bags I won’t have the room to put anything else. Also, while perhaps unlikely I think the homeowners might find it odd if their trash is gone, or half their trash is gone while their neighbor’s trash is still around when they leave in the morning. If they get weirded out by that they could change their habits (by putting it out in the morning, for example), leading me to miss out on their future trash. I like to leave the scene looking more or less like it did before I got there. This situation though was different, because it was the end of the night (no more things to potentially have to fit in), and I took only a couple of bags, leaving the pile looking more or less intact. On the vase call the Czech vase call or contact the Cedar Rapids Czech Museum in zcedar Rapids, Iowa. They are always buying glass of any kind made in the Czech Republic. Good luck ! I never find much in wealthy neighborhoods here in NJ – these folks must hire someone to clean for them and not leave anything as “common” as trash bags out front. However, I can certainly identify with tossing entire bags into the back of my pick up truck and examining the contents on safer ground. We call these “Mystery Bags.” What fun! Keep up the great blog – I enjoy every detail! There’s no “heavy garbage” days out there? There’s a few neighbourhoods here where you’re not allowed to put out anything but what you can fit into a bin, except one day a month when you can put out whatever. Maybe there’s something like that going on. Good for you for going back !